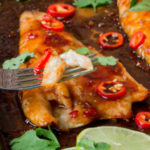 12 minute sticky Asian Sea Bass - Soft, flaky fish with a sweet and spicy flavour kick. Mix the oil, chilli, honey, soy sauce, ginger, garlic and lime in a small bowl. Place the sea bass fillets, skin-side down, on a baking tray. Sprinkle on the cornflour and rub it into the fish gently. Spoon on the honey-soy sauce mix (it will pour off a little, but that's fine). Sprinkle on the sugar and place in the oven to cook for 8 minutes. Half-way through cooking, open the oven and baste the fish with the sauce in the tray (it will be stickier now it's been in the oven). Once the fish is cooked, take out of the oven and baste again with sauce, then sprinkle the top with coriander and slices of chilli. Serve with lime slices and some boiled rice or salad. Tried this recipe?Mention @KitchenSanctuary or tag #kitchensanctuary on Instagram!